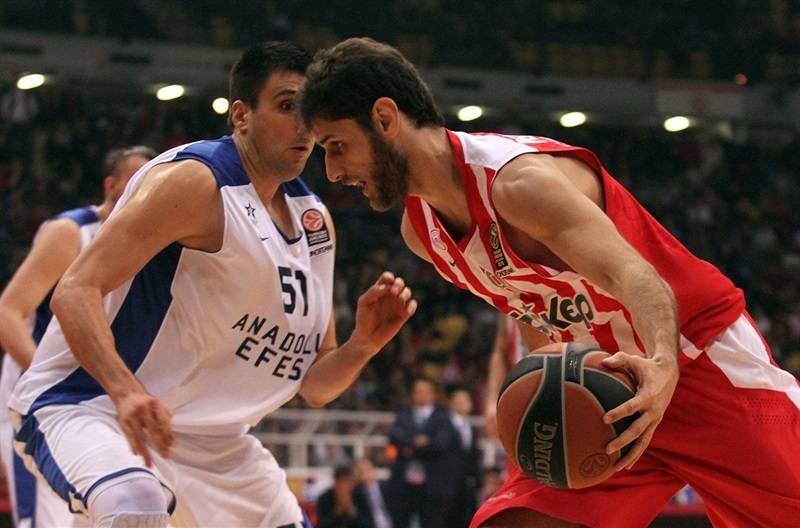 Olympiacos Piraeus improved to 4-2 in Top 16 Group E by thrashing Anadolu Efes Istanbul 78-60 at home on Thursday. 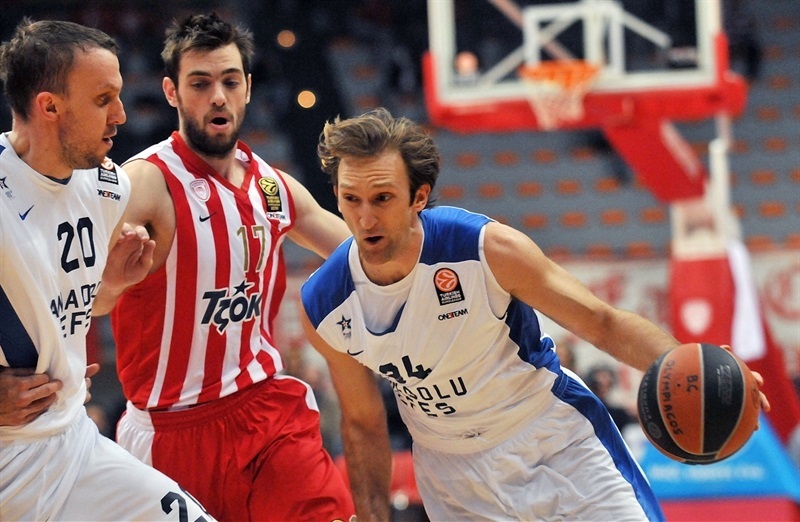 Olympiacos grabbed its third consecutive win, while Efes dropped to 2-4. Vassilis Spanoulis paced the winners with 16 points. Matt Lojeski and Bryant Dunston each added 13, while Mirza Begic had 10 for Olympiacos. Zoran Planinic led Efes with 13 points and 7 assists, but the guests were outrebounded 38-28. A three-pointer by Kostas Vasileiadis tied the game, 7-7, in the early going. Spanoulis led a 10-1 Olympiacos run and soon added an off-balance basket that gave the Reds a 24-10 lead late in the first quarter. Efes improved its defense from that moment, as Milko Bjelica and Dusko Savanovic carried the guests to within 36-29 at halftime. 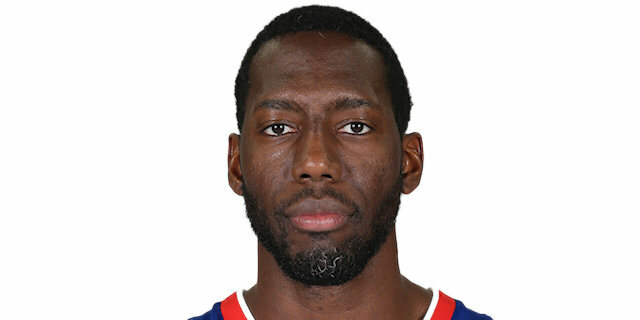 Olympiacos found a go-to guy in Dunston, who got plenty of help from Spanoulis and Brent Petway to break the game open, 62-43, at the end of the third quarter. 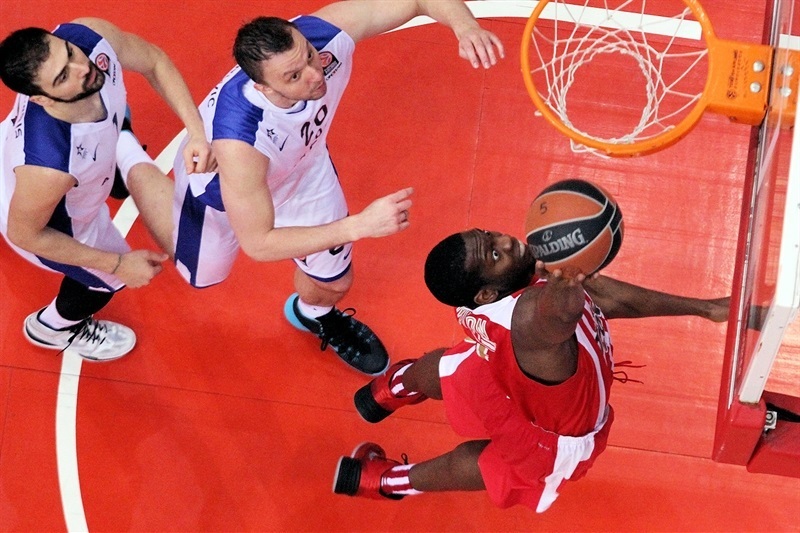 Olympiacos boosted its margin to 70-46 midway through the fourth quarter and never looked back. Matt Lojeski got Olympiacos going with a corner three-pointer and a jump hook by Bryant Dunston gave the Reds a 5-0 lead. Zoran Planinic stepped up with a close basket that Spanoulis erased with his trademark driving layup. Kerem Gonlum swished a four-meter baseline jumper and a three-pointer by Vasileiadis tied it at 7-7. 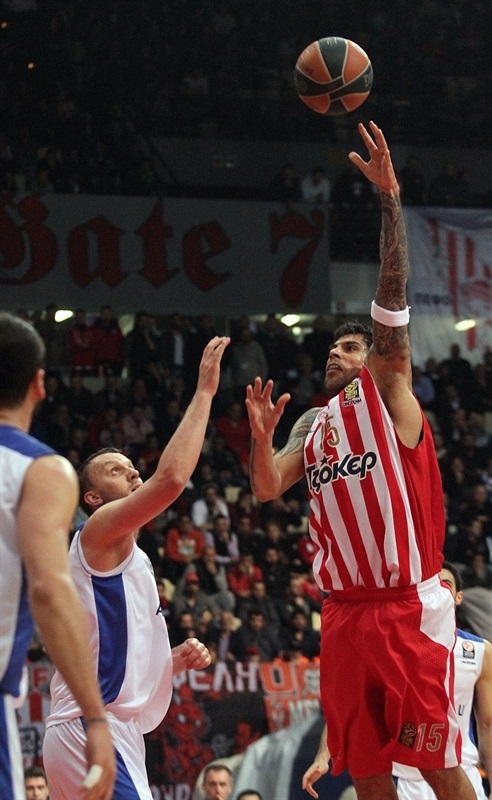 Lojeski nailed a five-meter jumper and a jump hook by Georgios Printezis gave Olympiacos fresh air at 11-7. 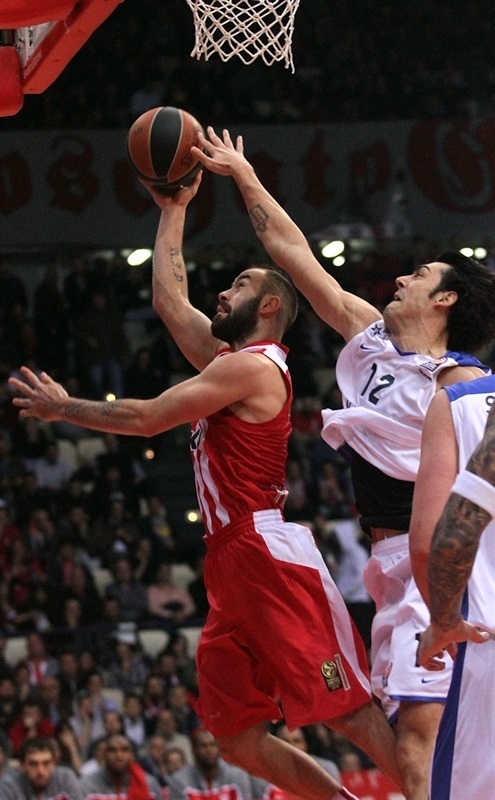 Efes kept struggling to score and a driving basket by Spanoulis made it a 6-point game. After Dogus Balbay split free throws, Spanoulis added another big basket in penetration and a fallaway jumper by Lojeski boosted Olympiacos's lead to 17-8, after a 10-1 run. Balbay and a red hot Spanoulis traded layups and a catch-and-shoot triple by Brent Petway caused Efes to call timeout at 22-10. Spanoulis shined with an off-balance basket, but Balbay erased that with an acrobatic layup in transition to make it 24-12 after 10 minutes. 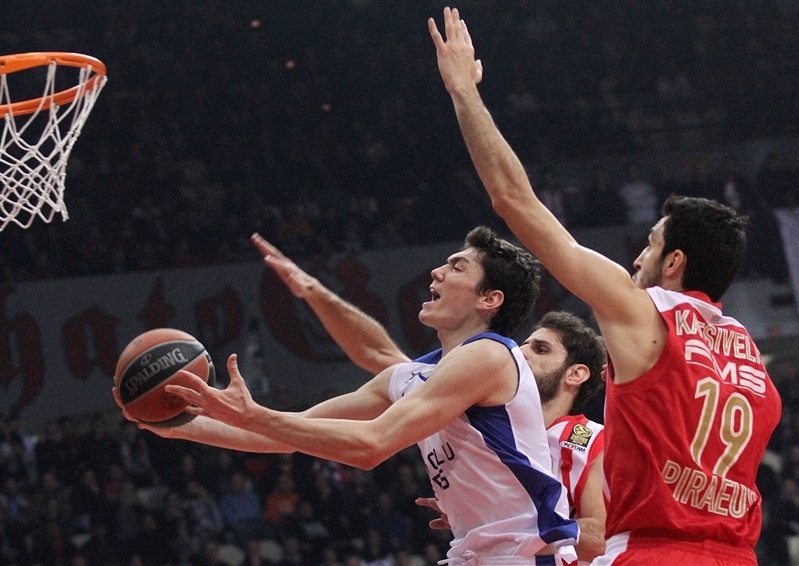 Cedi Osman shined with a fast break layup early in the second quarter, as Olympiacos started to miss open shots. Meanwhile, Milko Bjelica scored around the basket to bring Efes within 24-16, after a 0-6 run. Mardy Collins stepped up with a one-handed jumper in the lane, which Bjelica matched with free throws. Mirza Begic split foul shots, but Planinic brought Efes even closer, 27-20. 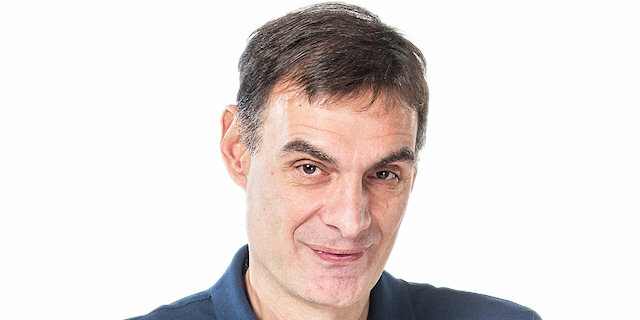 Begic scored around the basket. Planinic split free throws before a jumper by Stratos Perperoglou restored a 31-21 Olympiacos margin. 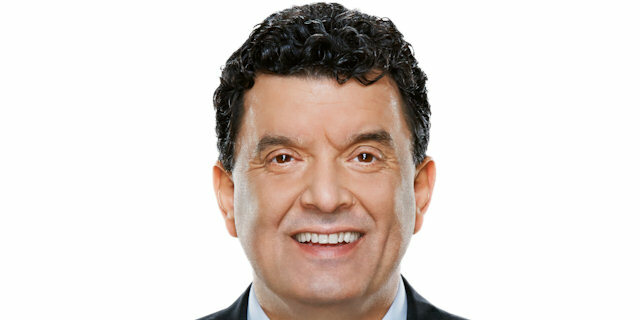 Dusko Savanovic nailed a mid-range jumper that Begic matched with a two-handed slam. Birkan Batuk struck from downtown and Begic dunked again, but Olympiacos struggled to get its wing players involved without Vangelis Mantzaris and Spanoulis on court. Vasileiadis split free throws and Savanovic gave the guests some hope at 35-29. A free throw by Spanoulis gave Olympiacos a 36-29 edge as the teams head back to the locker rooms. Dunston ignited the crowd with a big slam immediately after the break. Planinic quickly answered with a driving layup and Balbay scored in transition to make it a 5-point game. Spanoulis fed Dunston for a one-handed dunk in transition and then found Lojeski for a wide open triple, good for a 43-33 Olympiacos lead. Petway dunked and Efes started to miss open shots. A three-pointer by Spanoulis forced the guests to call timeout at 48-33. 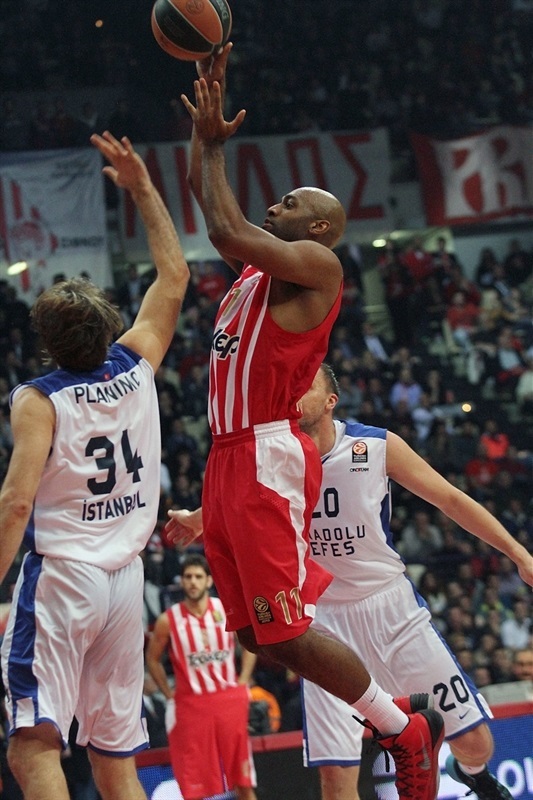 Dunston kept pacing Olympiacos with a high-flying three-point play that broke the game open. Spanoulis stayed on fire with a fast break layup that capped a 15-0 run. Planinic tried to change things with a close basket and free throws by Semih Erden brought Efes within 53-37. Lojeski struck from downtown and Dunston followed a power basket with free throws to make it a 23-point game. Bjelica and Batuk nailed back-to-back triples before a wild alley-oop slam by Petway fixed the score at 62-43. Kostas Sloukas nailed a jumper early in the fourth quarter for a 64-43 Olympiacos margin. Savanovic split free throws, Cedric Simmons did not miss from the foul line and a turnaround jumper by 18-year-old prospect Emircan Kosut kept Efes within 66-46. Perperoglou scored around the basket to seal the outcome, 68-46, midway through the fourth quarter. 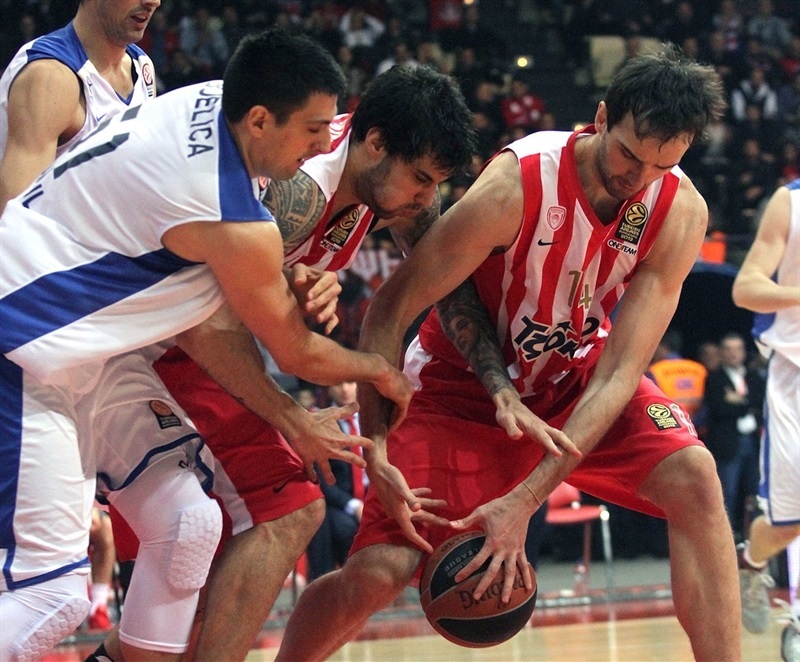 Olympiacos stayed strong on defense and a dunk by Begic boosted the Reds' lead to 70-46. Osman struck from downtown and Kosut nailed a mid-jumper for a 70-51 Efes deficit. Osman kept pacing Efes with a fast break layup and a wild basket by Balbay made it a 15-point game with three minutes left. Osman split free throws, but Perperoglou and Petway allowed the Olympiacos fans to start celebrating an important home win, 74-56, as Efes never recovered. "We managed to achieve a very important win, which was our third in a row in the Top16. During the first half we had 3 assists and we finished the game with 16. We controlled the boards and we won pretty easily, while we tried to keep our players fresh with the most playing time. Now, we have the upcoming game against PAOK in the Greek League and then we will prepare the team for the Euroleague Top16 game against Panathinaikos. " "I don't have much to say about the game. We approached it the wrong way, despite our problems. One of the causes was the tiredness, but our general approach was wrong and that cost us. While our assist-to-turnover ratio is not bad, we made bad choices in offense. We attacked the basket without examining the second or third choice. In the second half, there was no game. Gordon had a 38 degree fever and didn't feel well. It was impossible for him to play, and Gonlum hurt his knee, but it is early to say something specific about his situation. " "I didn't expect the game to be so easy. We said before that we had to increase our performance and improve our game and we succeeded. We controlled the rhythm of the game, we worked hard during the game and we had energy and passion. When Anadolu Efes cut the margin to 5 points, we fought back and with our defense, we escaped again and finally accomplished our fourth win. " "Unfortunately we didn't execute our game plan. When you let Olympiacos run in the open court, it is very difficult to stop. Our defensive level was not as high as in the previous Euroleague games, while after the Turkish Cup battles, we had a lack of energy. Olympiacos was fresher and they used their energy to beat us. "